The standard of care provided for people with dementia is "patchy", the National Institute for Health and Care Excellence (NICE) has said. Some people with the condition were not getting even basic levels of care, it added. The warning came as NICE unveiled new standards for dementia care in England, covering issues such as housing and access to leisure services. 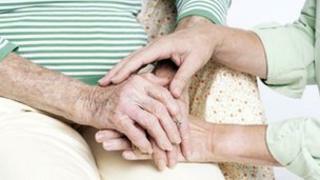 Care services were playing "catch-up" on dementia, it said. The guidance is the first to be produced by NICE under its new extended remit. To date, the organisation has focused on issuing recommendations about NHS treatments and encouraging healthy lifestyles. But under the shake-up of the NHS, it now has responsibility for providing guidance on care and support provided by the likes of councils and care homes. NICE's dementia guidance includes 10 standards it wants the care sector to follow. One calls for people with dementia to live in housing that meets their needs, while another says they should be given the support they need to access leisure activities. Others focus on keeping patients involved in community life and ensuring they get access to services such as dentists and opticians. NICE deputy chief executive Prof Gillian Leng said: "The general picture is that care is patchy. "We know that it is really good in places but it's not consistent. "My personal view is that we are all playing catch-up because the number of people with dementia has been increasing so dramatically." Currently about 670,000 people in England are living with dementia but one in three over the age of 65 are expected to develop the condition. George McNamara, of the Alzheimer's Society, said people with the condition were being denied the quality of life they deserved. "These standards will be a useful tool for the care sector and show what people with dementia and carers should be able to expect," he said. "But, as they are not mandatory, it's a case of 'wait and see' as to whether this guidance will drive real change or just sit on the shelf."